Actor Michael Douglas’ son Cameron, who pleaded guilty to drug trafficking, got a five year prison sentence and a $25,000 fine in New York federal court on Tuesday, the Associated Press reported. U.S. District Judge Richard told the 31-year-old Douglas that this was his “last chance to make it.” Douglas apologized for his crime during the sentencing which was attended by his father, AP reported. In January, Douglas, 31, pleaded guilty to selling large quantities of methamphetamine and cocaine while staying at Hotel Gansevoort, a trendy Manhattan hotel. He was busted by the DEA. 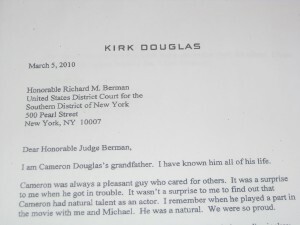 Ealier this month, Douglas’s grandfather Kirk Douglas and step-mother Catherine Zeta-Jones were among some famous folks to submit letters to the judge asking for leniency and understanding. “Cameron was always a pleasant guy who cared for others. It was a surprise to me when he got in trouble. It wasn’t a surprise to me to find out that Cameron had natural talent as an actor. I remember when he played a part in the movie with Michael and me. He was a natural. We were so proud. Posted: 4/20/10 at 7:10 PM under News Story.